The economic impact of the Russian sanctions on Turkey announced this weekend will, in general, probably will be limited, William Jackson, Senior Emerging Markets Economist at British economic research and consulting company Capital Economics believes. The maximum losses to the Turkish economy next year will be worth around $4-4.5 billion, or 0.5 percent of GDP, according to the Capital Economics report, obtained by Trend. 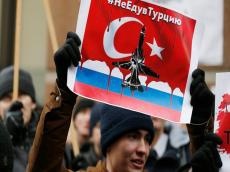 This weekend, the Russian government announced economic sanctions on Turkey in retaliation for the downing of a Su-24 bomber last week, the report mentioned. There were three prongs to the sanctions. The first is to halt or ban activities by certain, as yet unspecified, Turkish firms and individuals in Russia. Second, imports of certain (also unspecified) goods will be banned. The final prong regards tourism: Russian charter flights to Turkey will be banned. Jackson believes that banning Turkish firms working in Russia is likely to have limited repercussions. “Only 90,000 Turkish nationals work in Russia. More generally, remittances and investment income from Turkish workers and firms abroad (both in Russia and elsewhere) play a small role in the Turkish economy, totalling $848 million and $314 million respectively in 2014 (0.1 percent and 0.05 percent of GDP)," he said. Regarding the ban on imports, Jackson stressed in the report that agricultural goods are likely to be prohibited. “This has typically been Russia’s main form of trade retaliation; indeed, Turkish food products are reportedly already coming under greater scrutiny by regulators. And banning other major Turkish exports – mainly intermediate manufactured goods – would hurt Russia’s struggling industrial sector,” Jackson said. Overall, according to the report, Turkish agricultural exports to Russia amounted to a modest $1.2 billion last year, equivalent to just 0.15 percent of Turkish GDP. “In other words, while particular Turkish agricultural firms may suffer, the impact on Turkish exports, let alone GDP growth, from the import ban is unlikely to be discernible,” he said. Meanwhile, there will be ramifications from the import ban for Russia, Jackson believes. “Turkey accounts for around a quarter of Russia’s total food imports. Sourcing these from elsewhere will be more expensive, particularly since Russia has already banned food imports from the EU, US, Australia, Canada and a few other countries,” economist said. Jackson believes that perhaps the most damaging impact to Turkey from the sanctions will come via tourism. Some 4.8 million Russians visited Turkey last year, accounting for over 10 percent of foreign arrivals, according to the economist. “It’s difficult to make any precise estimates, but to take an extreme example, were no Russian tourists whatsoever to visit Turkey over the whole of 2016, the loss to Turkish tourism revenues might amount to $3 billion, or around 0.4 percent of GDP,” Jackson said. Meanwhile, he believes that the impact on Turkey’s tourism sector will depend heavily on how long the sanctions remain in place. “The Turkish tourism industry is highly seasonal; Russian tourist arrivals have tended to be seven-to-ten times higher in Q2 and Q3 than in Q1. So if the sanctions are lifted soon, the damage should be limited,” economist said. Overall, Jackson believes that while damaging, it’s unlikely the Russian sanctions to be game-changer for Turkey. “The big picture here is that the outlook for Turkey will rarely, if ever, hinge on Russia. Its economy strengthened this year despite Russia’s recession. Factors such as the current account deficit and the recent credit boom are much more important, and indeed more worrying,” Jackson said.